Wrote This Yesterday, Too Tired To Post It. LONG! Recent rain has suited my mood perfectly. Gloomy through and through. The truck was covered by several tarps “just in case”, so at least I didn’t have to worry about it too…or so I thought. I guess a bit of wind must have picked up, and pulled the top tarp askew, allowing water access to the unprotected roof sheathing. Water made it’s way down through the wool insulation and into the ceiling. Sigh…but no permanent damage done. Wool is very forgiving. When sunshine peeked through yesterday, I pulled the tarp off to allow drying to start. According to Weatherbug, no more rain is predicted for a few days so I’ll leave the roof uncovered as long as possible. My aching body and hand appreciate the break. No laying around for me though! I’ve been using the indoor time to once again sort through the many piles of stuff I accumulated for the original Oliver’s Nest. It’s a bittersweet time, seeing the cool supplies for that build, many of which aren’t needed for the much smaller truck house. 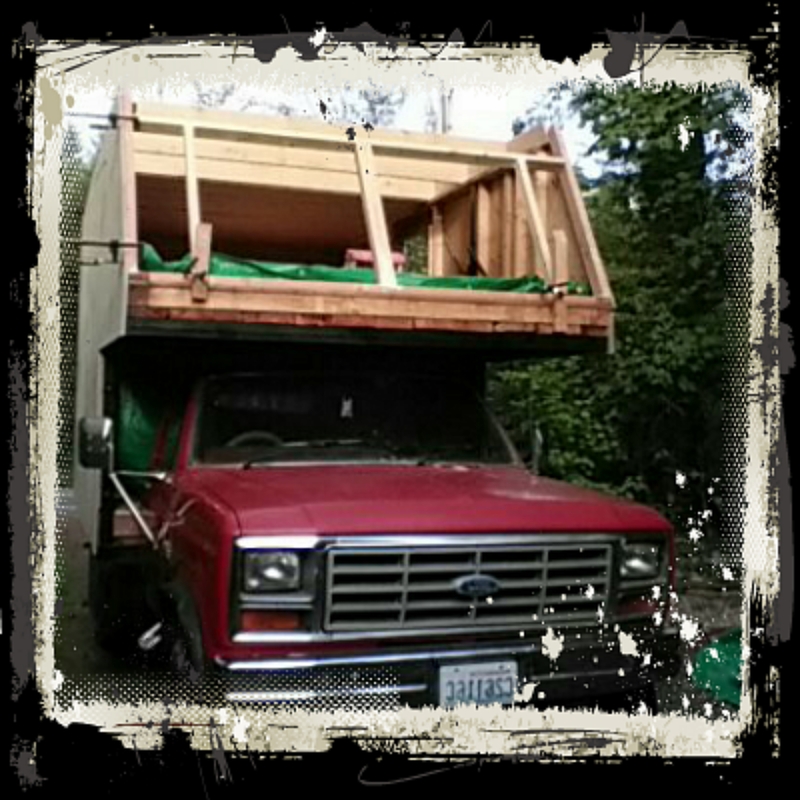 It’s doubtful i’ll manage to hang on to the trailer house, so I’m letting go of things I worked for years to gather. Hopefully there are people out there who can put them to good use. 😐 There’s always the option to re-donate items to a ReStore. I refuse to just dump them. Of course, now if I need something for this build, it’s now easy to find. A huge plus. Another large and potentially painful project is letting go of a huge amount of computer and other electronic goodies. As an old computer builder and wannabe geek, hanging on to potentially useful bits and pieces is second nature. That simply won’t work. There are many used computer repair shops in town I’ll be donating supplies to. I’m working my way through the food supplies as I have a ton of it in standby. Lots of interesting meals as a result again! I’m working towards eating the high fat, mid protein, low carb diet as soon as my cupboards are bare. Should be interesting on the road…. But some health issues dictate I try. To end this rather lengthy update, I’ll fill you in on my current adventure. I’m writing this while sitting on a curb at a local store (looking for heavy-duty hinges), waiting for a tow truck to carry my little scooter home. I tried to get away with using her while gathering funds for her repair, which apparently was a bad idea! Yay, me! What’s going on here is that I’ve started framing in the two front windows and one of the skylights. Lots and lots of glue! I am proud of you that you are hanging in there. Me too. Would the French door set work in the front of the truck and just open it from the bottom for air? That might look nice and not require another piece of glass or plexiglass to keep it air tight. Then shop for sky lights and let me know what they would cost. I have had some blessings come my way and I might be able to squeeze some your way. I worry that abusive men might try to help you as they love women in trouble and they are not the right men. Please be careful as God loves you and I pray for you daily. and I will send angels to guard you in all your ways.